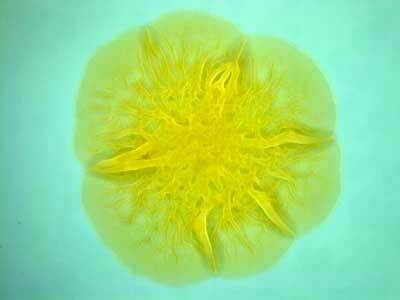 (Nanowerk News) Slimy, hard-to-clean bacterial mats called biofilms cause problems ranging from medical infections to clogged drains and fouled industrial equipment. Now, researchers at Princeton have found a way to cleanly and completely peel off these notorious sludges. Yan is the co-lead author of the paper describing the results, published in Advanced Materials ("Bacterial Biofilm Material Properties Enable Removal and Transfer by Capillary Peeling"), along with Alexis Moreau, who was a visiting student in Stone's lab and is now back at the University of Montpellier in France. To learn how to avoid such fragmentation, the Princeton team examined the attachment of the V. cholerae biofilms to a variety of surface types. The researchers saw that the edges of the biofilms were water repellant, while surfaces they adhered to were sometimes water-attractive. Based on this insight, the researchers sought to drive a wedge between the biofilm and attached surface by driving water into the space at which the materials meet. This technique, known as capillary peeling, successfully created a lengthening crack that culminated in full separation of the biofilm from the surface. The water-assisted peeling must go slowly to prevent biofilm tears -- akin to carefully removing a sticker -- but the results showed that the extra time was well worth it. "Our capillary peeling method worked astonishingly well," said Yan.